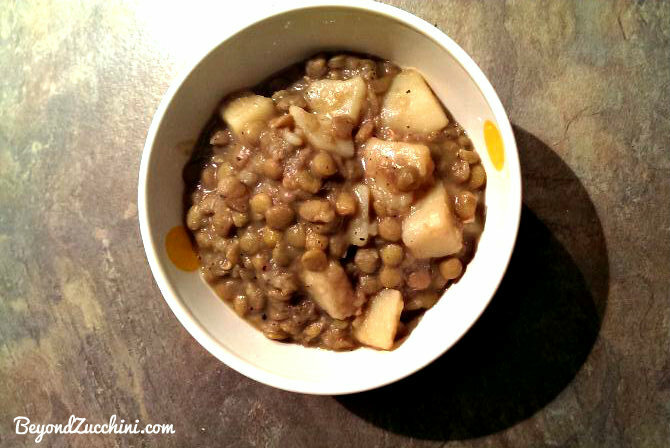 What I also like about lentils, and this dish in particular, is the easy preparation and the simplicity of its ingredients. Moreover, unlike beans, there is no need to soak lentils in advance. Moreover, it tastes so good that my toddler can easily eat more than one bowl! 1. To prepare the lentils, wash them and then let them boil for around 20 minutes. Drain and set aside. 2. Saute the onions with the rapeseed oil until brown. Add the potatoes and then the spices, stir for one minute. 3. Add the water, allow to boil, and then simmer for around 30 minutes (or more, depending on how chunky you like the consistency). 4. If you wish, add some olive oil right before serving.